I know some of you are waiting patiently for the hallway bookcase reveal in our upstairs hall and I am too! I don’t have the right kind of tool I need at the moment (which is totally frustrating) so I’m waiting on my uncle (who built our sunroom) to stop by and help me out. While we all sit patiently and wait, I thought I would introduce you to my friend Heather! Heather and her family live right here in Michigan too, and I’ve known her since high school. She has such a great eye for home decor, fashion and hair (she is my hair stylist, so I can totally vouch for this) and I know you are going to love her style. She just started her blog, The Project Farm, to share all the details of the house they recently bought, gutted, and fixed up. 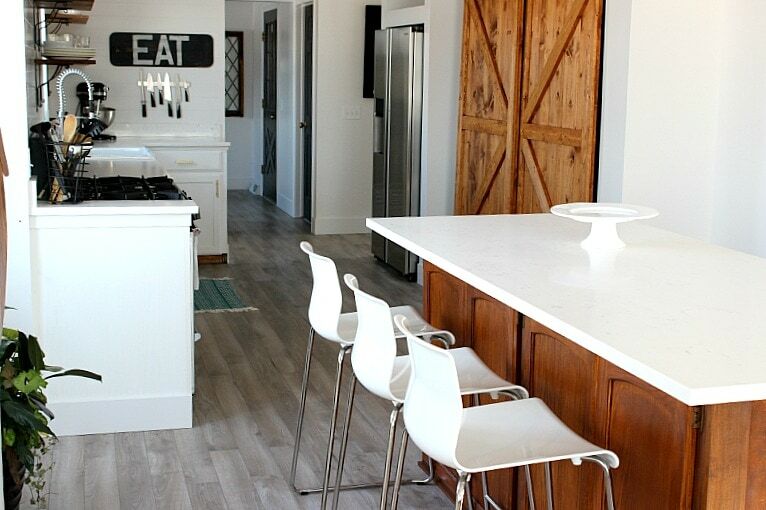 You cannot believe the before and after shots of this house, she really had such a great modern farmhouse vision for it, which fits in perfectly with the goats and baby chicks that came along with the property. I have seen her gorgeous home in person (her cute salon is right in her home) and I just had to share a few pics! 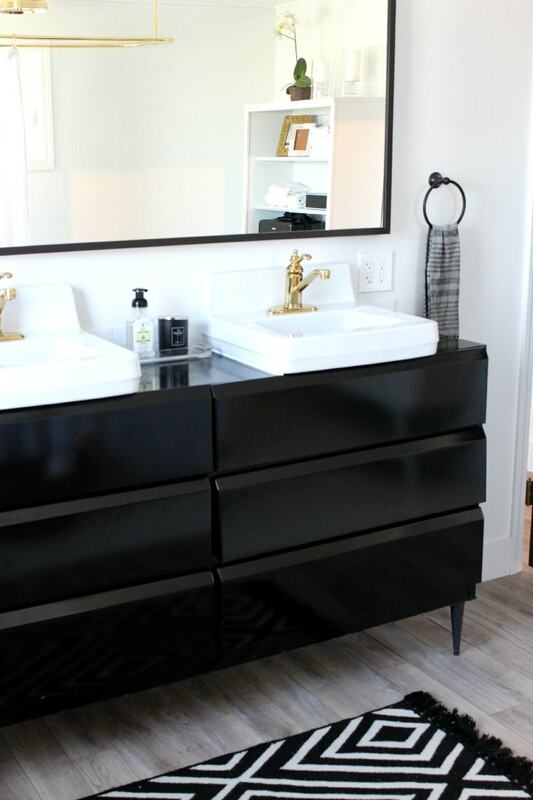 First up, their gorgeous master bathroom – be sure to check out their amazing bathtub on her blog (you can glimpse a sneak peek in the mirror in this photo). 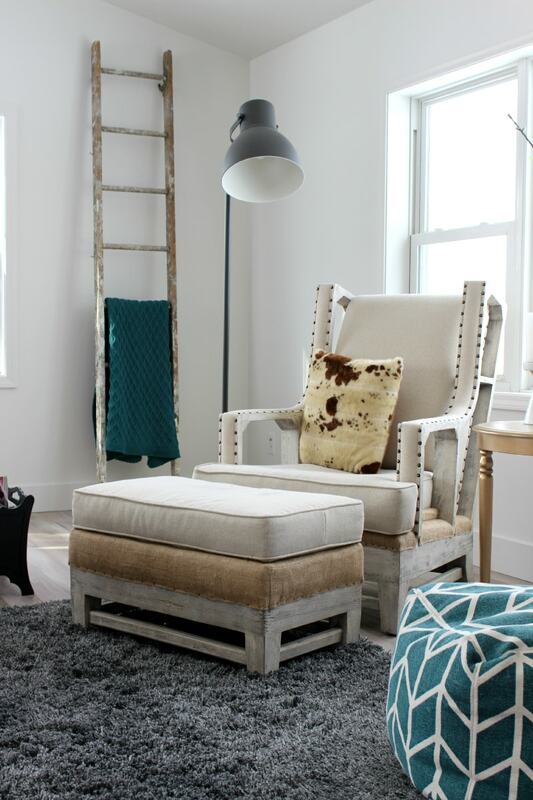 I love how she was able to balance the modern and rustic elements in this house. I’m totally obsessed with the farmhouse style table in their dining room! 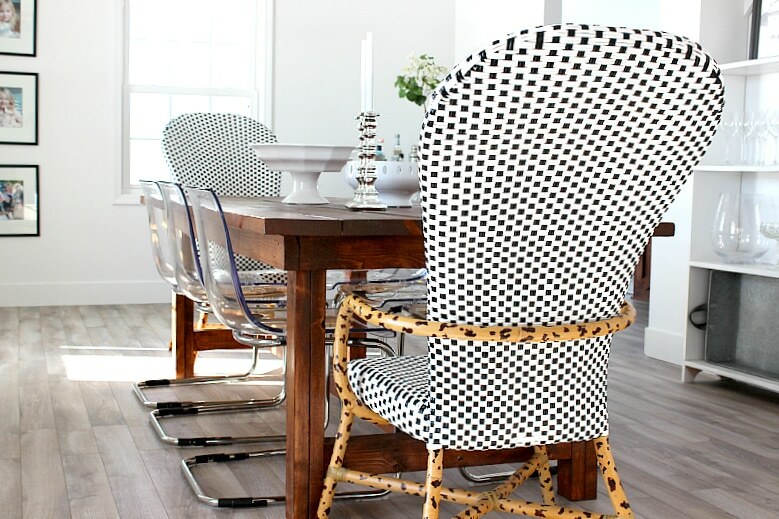 The mix and match chairs add such an eclectic vibe. And are you not crazy about this wallpaper? This is the mudroom right off their garage that leads into the salon in her home. 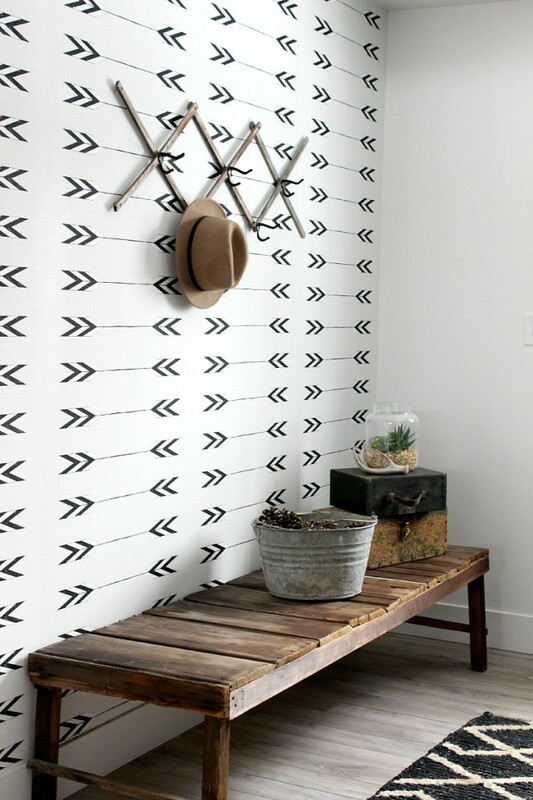 This wallpaper makes another appearance on their staircase too, that is totally genius. Basically I could move right in, especially if it meant she would style my hair for me every morning! Heather is just starting out her blog, so head on over and check out the rest of her gorgeous home, and welcome her to good ole crazy blog land. and cross your fingers I have a few completed projects of my own to share soon! Thanks Marie! I know, she is awesome! How do we sign up or her blog as I see no place to do it? Hi Jeanie, she is just starting out so she doesn’t have an email feed yet. You can follow her on instagram but hopefully soon she can get that set up. You can also bookmark her site in your favorites too! I love these pics! I would love to follow her blog as well and her home is beautiful, but I’m always so scared to do anything too trendy with something that is permanent or a pain to change out like wallpaper, fixtures or furniture. Love the wallpaper! Who makes it? Do you know who makes that fabulous wallpaper?